UK consumers are locked in a vicious circle with brands over customer experience, according to new research from Accenture (NYSE: ACN). While 47 percent are frustrated when companies fail to deliver relevant, personalised shopping experiences, nearly half (48 percent) are concerned about personal data privacy as they subscribe to intelligent services designed to understand and anticipate their needs. Poor personalisation and lack of trust cost UK organisations £77 billion last year, as 38 percent of consumers switched companies. Without deeper customer insight, companies cannot deliver the experiences they crave. The thirteenth annual Accenture Strategy Global Consumer Pulse Research gauged the attitudes and expectations of more than 25,000 consumers around the world, including 1,800 UK consumers, about their appetite for more intuitive, technology-driven brand experiences. As organisations strive to become ‘living businesses’ – companies that are extraordinarily pre-emptive and responsive to changing customer needs – the study revealed a significant digital trust deficit that must be addressed before true customisation can be delivered. “As technologies such as artificial intelligence, machine learning and digital assistants become more sophisticated and mainstream, companies are creating new touch points, offerings and services that intelligently anticipate and flex to their customer’s precise needs, offering a level of hyper-relevance not experienced before. Those that succeed will hit a ‘sweet spot’ whereby UK customers will be willing to share more personal insights into their world in return for greater value and the confidence that their data is protected,” said Rachel Barton, managing director and Advanced Customer Strategy EALA lead, Accenture Strategy. Thirty-seven percent of UK consumers are more likely to shop with companies that always personalise experiences, as long as their trust isn’t compromised. Over a quarter (twenty-seven percent) say they would find great value in services that intuitively learn about their needs over time to better customise product, service or content recommendations. Nearly half (49 percent) of UK consumers would use ‘smart-reordering’ services where intelligent sensors in the home pre-empt when a product, such as laundry detergent, is running low and automatically re-orders it on their behalf. Another 31 percent use digital assistants. While the vast majority (89 percent) are satisfied with the experience, 42 percent say it can feel slightly creepy when technology starts to correctly interpret and anticipate their needs. Digital trust remains a critical barrier to enabling hyper-relevant experiences. Expectedly, a clear majority (89 percent) of UK consumers say that it is extremely important that companies protect the privacy of their personal information. 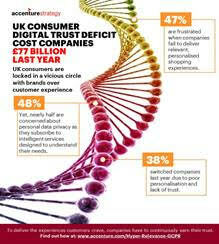 Another 76 percent say it is frustrating to realise that some cannot be trusted to use it appropriately. Forty-three percent of UK consumers fear intelligent new services will come to know too much about them and their family. Overall, 58 percent want companies to earn their trust by being more open and transparent with how their information is being used. “Digital trust will become increasingly challenging for companies to achieve as they look to capture new categories of customer data, such as biometric, geo-location and even genomic data, in their drive for greater relevance. Customer concerns will inevitably rise, so it’s critical that companies have strong data security and privacy measures in place, they give customers full control over their data, and are transparent with how they use it. This is particularly pertinent as organisations prepare for the General Data Protection Regulation coming into force in May 2018,” Barton said. Giving customers full control of their data – In anticipation of the General Data Protection Regulation (GDPR), which gives individuals the power to decide how companies can use their personal information, organisations must become more transparent. Customers must be given full access to, and control over, their data which will demonstrate responsible stewardship and ethics. Furthermore, they must ensure the appropriate safeguards are in place to protect it. Creating new customer value – Companies that distinguish themselves with hyper-relevant experiences look beyond the traditional customer journey. They prioritise areas where they can dynamically deliver something that customers value, at the right moment every time. Investing in precise insights – Hyper-relevant companies invest in predictive analytics, collaborate with an ecosystem of partners to capture real-time customer insight, and mine data in new ways to understand their specific needs.